I am sure there are plenty of moments in your life where don’t have the time to make a great tasting breakfast. However, what if you could wake up to a nice big jar of chocolate flavoured granola that’s healthy!? Let me show you how to do this. So, I’ve said that I don’t want any cooking robots in the past, meaning that I try to encourage you guys and gals not to always feel the need to follow a certain recipe to a tee all the time. And to try your own version of that recipe, to experiment and change things up a bit. And if there is one recipe that you shouldn’t be a cooking robot with, it’s granola. You can use any nut, seed, spice etc. you like. And it’s also one of those recipes that are great for trying to use up whatever’s in your pantry. All you really have to do is follow the foundational steps, meaning, add hot honey (or something like honey) to a bowl of your granola ingredients and mix together. Add any spices you want, put it all in a tray and bake in the oven low and slow until nice and toasted. Add any dried fruit you want as a final step and Boom! Your set. Hold on though, in this particular recipe we are incorporating chocolate? You bet we are!! 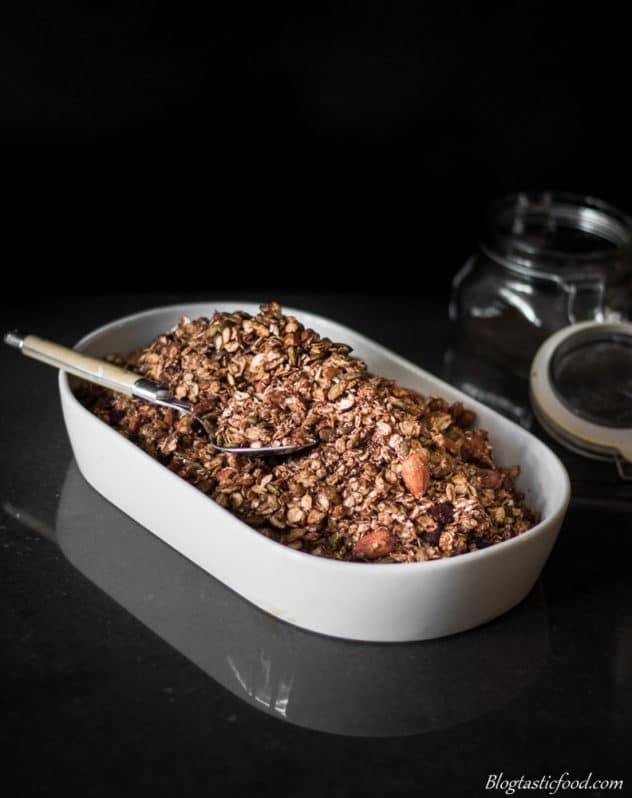 This granola recipe can not only give you a stress-free breakfast for the mornings to come, but it can also be a great breakfast for helping you deal with sweet cravings because you’re basically having a breakfast that gives you the taste and aroma of chocolate. The sweetness isn’t overpowering and it does the job. Now, let’s go over a few things. Absolutely, we aren’t getting the sweetness from sugar, we are getting from honey. And the Granola is not slathered in honey. Rather, there is just enough honey added to fully coat the granola and give it some sweetness. So each serving doesn’t have much sugar at all. Now, what makes the dish chocolaty? Of course, the cocoa powder. Now keep in mind that we don’t need to go crazy with this stuff, a little can go a long way. About 1-2 tablespoons will do the trick but no more than that, otherwise you’ll start getting a dry chalky texture. So where does the healthy part come from? 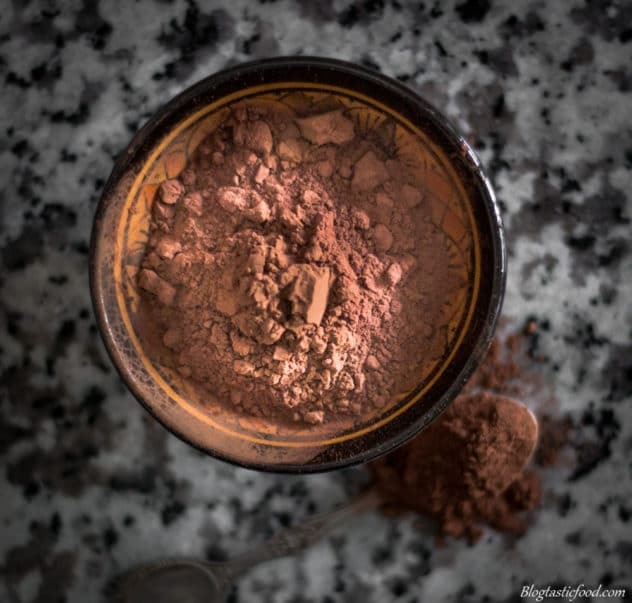 Well, cocoa powder actually has quite a few health benefits if you don’t consume it with a tone of sugar. It can help stabilise your blood pressure, it’s an antioxidant-rich food and it can also help to maintain your cholesterol levels. Now, I won’t get into the nitty-gritty of the health benefits as I am no expert. Instead, I will link the article that I got the information from at the bottom of this post. Although, this brings up a good point doesn’t it? Which is, why wouldn’t you incorporate a bit of cocoa in the morning? So Why Do We Heat Up the Honey? I’ll do you one better. When you add a bunch of super thick honey to a big bowl of dry ingredients, do you think it will be easy to mix through? Heck to the no is the answer to that one!! We need to thin it out so that when we add it to the oat mixture, every oat, nut, grain, seed etc. will be coated in that honey. And since we are heating up the honey, why not take that is an opportunity to infuse it with some aromatics? Here you can see that I have added a couple of cardamom pods to the honey as I heat it up, which will give the granola some extra aroma and flavour. Use whatever aromatic or herb you like. Rosemary, thyme, cloves, star anise, you name it!! Oh, and if you’re vegan and you don’t want to use honey. Maple syrup or golden syrup are 2 great alternatives. 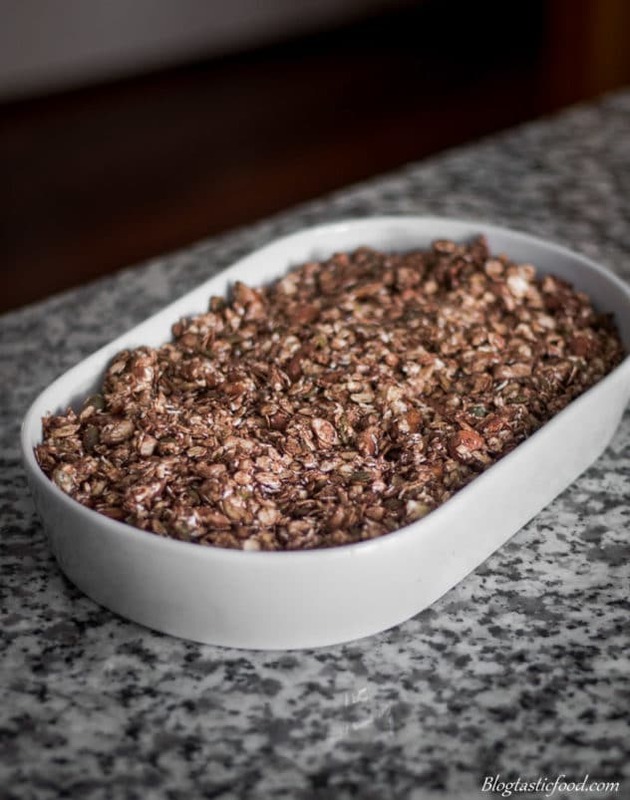 How long do I bake the Granola? So according to my research and results, the best way to bake/toast the granola is by keeping in the oven for a longer period of time but having the oven on lower heat. 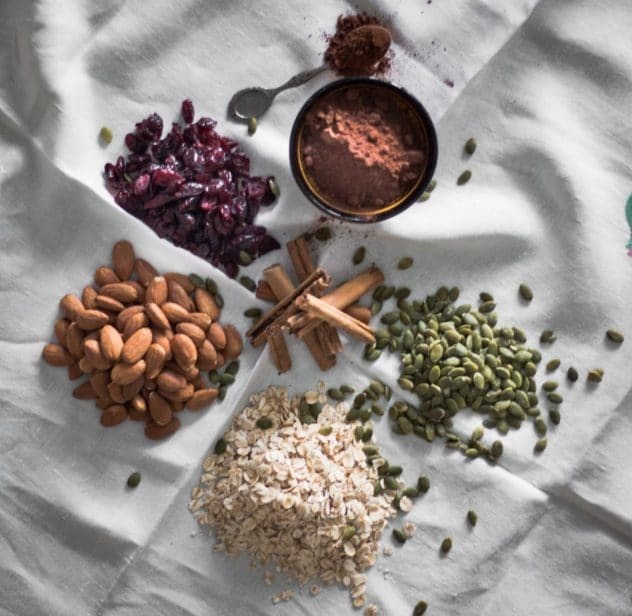 This ensures that your granola mix doesn’t burn and that those spices and honey cook away and release their beautiful aromas and flavours. As you can see, there isn’t a huge difference in how it looks, one just looks slightly darker than the other. However, there is definitely a big difference in terms of how it tastes and smells. A positive difference for sure. Ladies and gents, thank you for reading through this post. 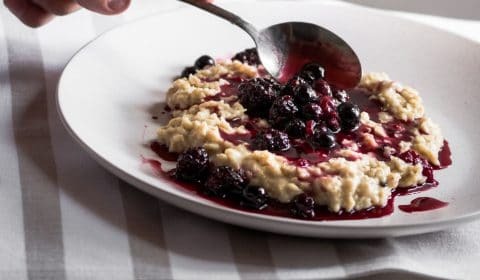 I hope I was able to share a new breakfast option that will help make your mornings that little bit easier to deal with. Feel free to subscribe to my blog. You will get weekly recipe posts sent to your inbox through E-mail. And you’ll also receive a free E-book featuring 10 amazing recipes. Have an amazing day! 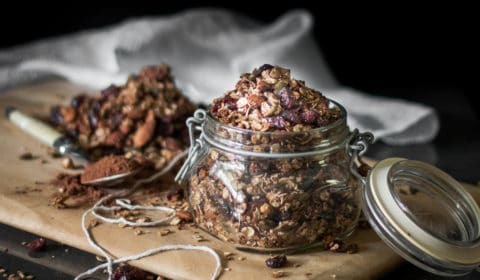 An easy and stress-free chocolate flavoured granola recipe that is both healthy and delicious. Make a nice big jar of this stuff and you'll be thanking yourself later. Mix the oats, pumpkin seeds and crushed almonds in a bowl. 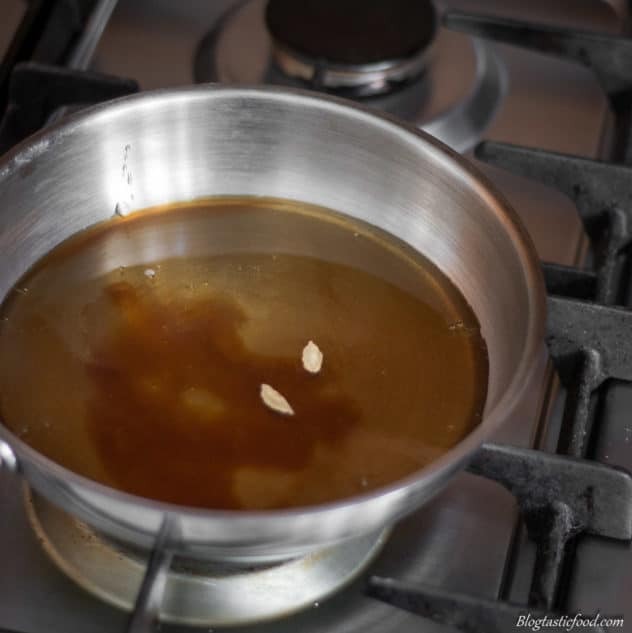 Put the honey and your vanilla extract in a small pot or pan. 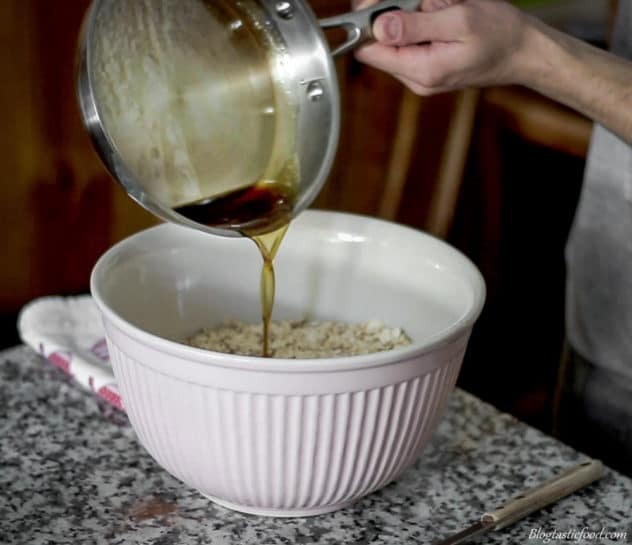 Heat the honey up until it thins out, then add it to your oat mixture. Mix the honey through until every oat, nut and seed is covered in the honey. Add your cocoa powder and cinnamon, then mix through. 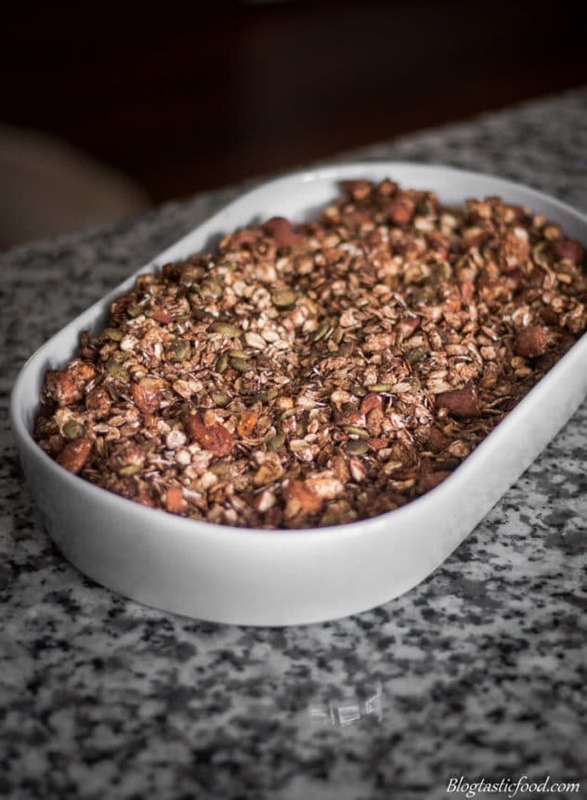 Spread the granola mix out onto a baking tray and bake in the oven for 20-25 minutes. Take the granola out, give it a good mix, then put it back in the oven and bake for another 20-25 minutes. Once the granola is done, take it out, let it cool for about 10 minutes then add your cranberries and mix I through. 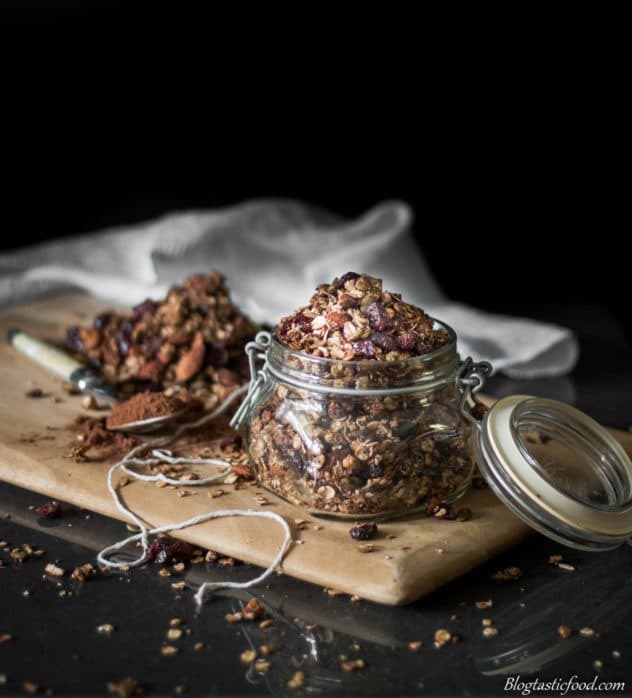 Store in a jar and your granola is ready!! Don't feel the need to follow the recipe to the tee. Add whatever spices, nuts, seeds etc. You like! Don't add to much cocoa powder, otherwise, you may have a dry, chalky experience when you eat the Granola. Heat up the honey so that it's thinned out. This will allow you to easily coat the whole Granola mixture. Feel free to spice the honey up by adding herbs or aromatics to it as it heats up. If you're vegan and you don't want to use honey, you can use maple syrup or golden syrup instead. 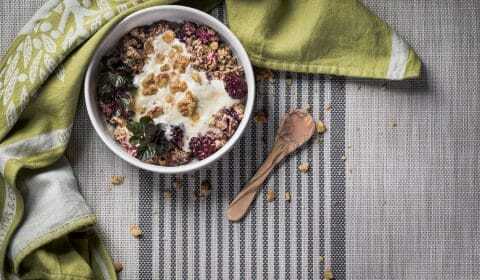 Bake the Granola at a lower heat for a longer period of time so it doesn't burn. Let the granola cool down a bit before you store it away. I appreciate the Alexandra! Have the most amazing day! Yum this granola sounds fantastic! I can always get on board with chocolate for breakfast! This looks like a really tasty granola recipe. The honey is a wonderful sweetener to have, so you don’t feel like you’re overloading on the sugar. I love any recipe that has healthy and chocolate in the title! This sounds delicious, a perfect way to start the day! i have wanted to make my own granola for quite some time now, but for some reason haven’t done it. This sounds amazing – awesome that you used chocolate. Such a delicious recipe! Love that this is chocolate flavored! Yum!